Thanks to incompatible Internet-ry you may have to copy and paste Subscribe@LEJ.org into your own e-mail form. Perhaps utilizing the nearly lost art of pen and paper for this tricky transfer. Carreta, on Jefferson Street, in Laughingyette has installed roll up front windows. Rather like spit-n-polish garage doors. "With big glass," Norma says. "Like Mitt Romney has for his fleet." The men who would be President. They are like fleeting warm days in Winter. They blow comforting smoke then icy winds. Like Bobby Jindal's cold-hearted exploitation of wee-the-people of Louisiana. At the Krewe du Vieux parade -- or drunk somewhere in a bar -- I saw a paper mache Jindal with a maniacal grin on his face bending at the waist towards the front of the float and blowing a fart out his rear at the face of Louisiana. But it is Carnival Time and we march on even with the prospect of schools and bridges closing. And without the sight and sound of Bo Dollis. Louisiana, we will never be the same. We pulled up the extension handles on our bags, and rolled them off down the street two blocks to the Rosa Parks Transportation Centre and Amtrak station.The evening train to New Orleans is forty-minutes late (considered by train-riders to be within the legal definition of on-time). As soon as we boarded the voice from the dining-car steward called last seating over the pubic address system. We had packed a backup meal that would keep, and went straight through the other coaches to the dining-car. "You have a six-thirty reservation?" the voice said to our face. I did not, but was seated anyway, with two cheery young women in the third day of their journey from California. They were bound for New Orleans to install the one -- an aspiring actress -- in a new career tramping the movie-making vineyards of Louisiana. The other was a painter inspired by Norman Rockwell, and only along for the ride. "I'm going back to California," she said. "I need clean, clear lines." Outside our window, Cypress trees kicked up their knees at live-oak trees dressed in Winter-green and Spanish moss. Saw-fan palmettos waved. Turtle families sat on logs ranked by their size. Snakes and alligators parted the water and wagged their tails. The jungle fell on top of itself like an ocean wave and a straight line was no more visible than truth in Baton Rouge. We pulled in to Big Swamp City exactly on time. Next morning, we took breakfast at Croissant D'Or Patisserie, in the French Quarter. Where we met Scott Nicely and his partner Robert Brunet. They met each other on Mardi Gras seventeen years ago. Scott was in Town from Knoxville, Tennessee and Robert, a native of nearby Houma, Louisiana, was living in Big Swamp City, New Orleans! "Hello, a new way of living," L. A. Norma says. The couple moved to Atlanta, where Robert is an executive with Whole Foods. He is Associate Coordinator of Prepared Foods for the South Region. "A very long winded way of saying I am in charge of all the Delis in Mississippi, Alabama, Georgia, Tennessee and The Carolina's. "My Son," Robert tells us, "and I found each other five years ago on Facebook. He was born when in school. His Mother and I were in school, just kids. Luckily we were adult enough to see that, and he was adopted out, successfully. "He and I both share a love of books and writing. Just last year he and his Wife had a child -- my Granddaughter -- and she is the reason we are in Town this weekend. "We spent Saturday night cooking Gumbo and BBQ Shrimp with a wonderful King Cake for dessert and of course, the next morning we spent eating brunch at Mr. B's. "Actually they ate while I danced around the restaurant with little Edith Frances." 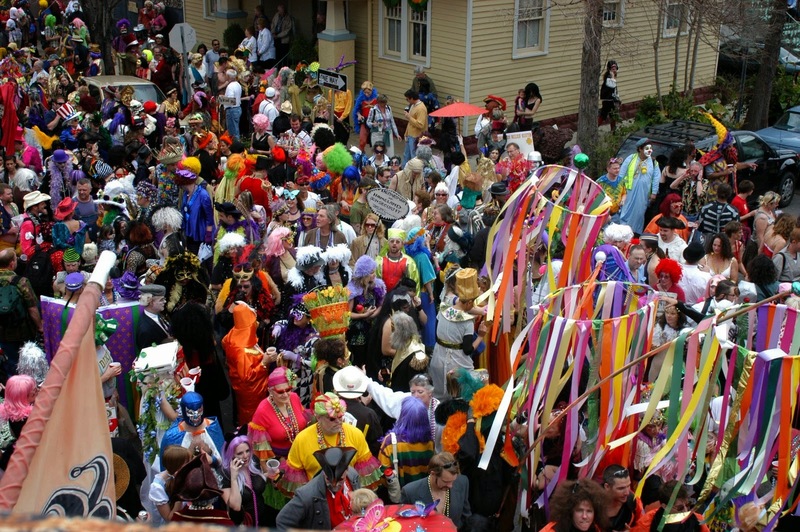 In Louisiana "Indians" means New Orleans Indians - - social clubs with names like Wild Magnolia, and made up of black men who out-costume everyone parading from Saint Joseph's Day up to, and including Carnival Day. Each Indian builds an annual New Suit of beaded and be-feathered glory, an homage to Freedom! To the chilling and thrilling idea of the escaped black slave. In a white man's world aided by Native American Indians. 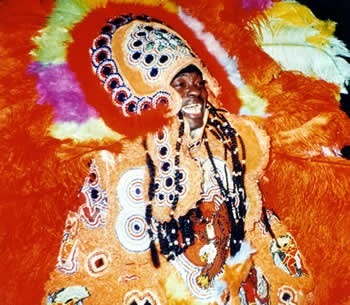 Let us take a moment to ponder the passing last month, at 71, of Bo Dollis, Big Chief of the Wild Magnolias. Your comments are welcome, post them in the Blog Comments.